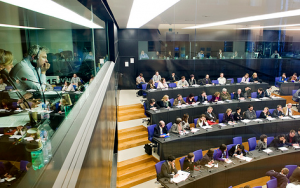 An interesting debate has broken out in Brussels this week over the declining number of accredited journalists that follow the work of the EU institutions. Charlemagne and Leigh Phillips have differing approaches to the issue, and Julien has a visceral blogging take on these matters. Today on Twitter the debate has been taken a step further, raising the question about what role bloggers can play in this – in some way making up for a decline in journalist numbers, or even – as @JanAlbrecht states – providing a public service, even paid. Essentially if I wanted to become a journalist – be that in print or online – then there would be ways and means of doing that. I would have to improve my writing style and research methods for a start, but it would be a viable career route. But I don’t actually want to do that, because I want to write about the things that are of interest to me, here and now, the things that are on my mind. I reckon I am better as a web campaigner and trainer than I ever would be as a journalist, hence why blogging is a sideline. All I have to make this blog work is my independence and my knowledge, and that creates the reputation of the blog – and having built that reputation over almost 5 years I dare not endanger that. It’s all I have. I state my name, my views, my opinions very clearly. I feel empowered to have a look into basically any political issue, and free to frame my pieces according to my ideological take on matters. That would be called into question if I were paid for what I do. The same goes for ads – I don’t want to even give the impression that I’m somehow linked to whatever financial interests would be portrayed in those advertisements and, anyway, the pittance it would earn me (because my reader numbers are between 600 and 1000 individual visitors a day) is not really worthwhile either. I agree, no public funding, no corporate sponsorship, and with between 200-800 hits a day barely worth click-through advertising. Seems we’re not the only ones debating this stuff – right after the twitter discussion I got a DM from someone offering me $50 project software to generate an income from my blog. I belong to British Mummy Bloggers. We’ve had the same debate there – would taking advertising mean that we couldn’t be honest about products/ services we mentioned (sometimes scathingly)? Would we get unsuitable advertising pictures of scantily clad women in the sidebar alongside the feminist dilectic? So the BMB website came up with the “Mummy Bloggers do it with integrity” badge you can find on my blog (it’s under the About section as my #fail is that I can’t work out how to put that sort of thing on the sidebar). Of course, mummy blogging faces an issue that euroblogging has yet to experience – “fake blogs” set up by companies to promote a specific product such as weightloss pills for losing the baby weight (and frankly that’s the mild end of the spectrum). I wonder what the euroblogging equivalent would be? Someone asked me the other day whether my blog damaged what I do in any way. The answer to that is yes, surely some people would never employ me for web projects as a result… But then plenty of people would never have even come across my work if I didn’t write the blog, so in a way the blog actually generates paid work – indirectly. Don’t want public funding either. If I did this for money it would be only half as funny. Now I can write when I want, what I want, how I want. I don’t have to care for readers, I can step on people’s toes, and I can stop blogging at any moment if it bores me. That is the luxury I enjoy in blogging.